MILL BASIN – This is what allegedly transpired yesterday, based on today’s deposition at the U.S. Eastern District of New York Courthouse. Yesterday, September 17, 2018 defendant Evon Stephens was captured by security cameras at the Kings Plaza Parking Garage between 8:10 a.m. to 8:25 a.m., attempting to access parked vehicles. Kings Plaza Shopping Center was not yet open to the general public, and when a security guard approached and directed him to stop, he walked away. Stephens then allegedly started a fire in a car owned by the Mercedes Benz dealership that uses the garage to store their vehicles. 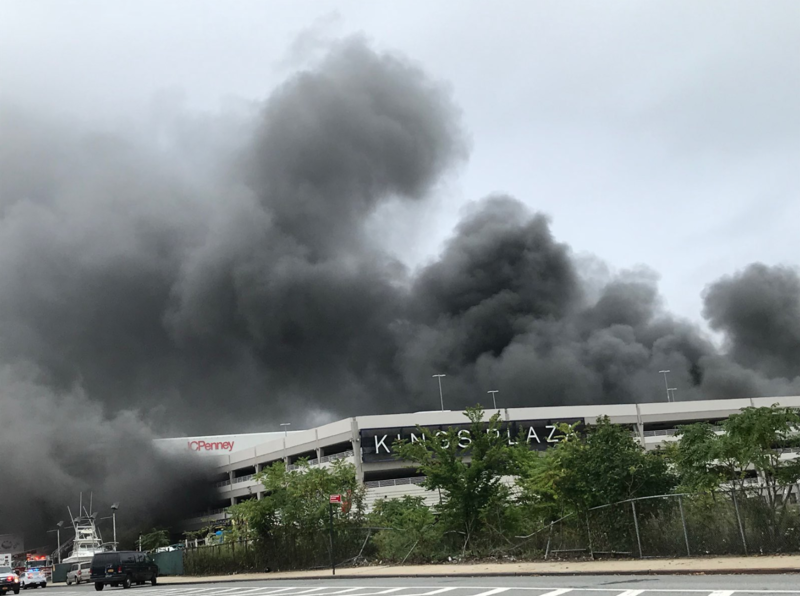 The fire spread from this area throughout the parking garage, law enforcement says, damaging more than 135 vehicles owned by various car dealerships. At approximately 8:20 a.m., after the start of the fire, surveillance cameras captured the defendant running from the parking garage, looking at a surveillance camera and making an obscene hand gesture towards the camera. By 3:30 p.m. NYPD officers had arrested him. Stephens told the cops in written statements that he was allegedly motivated to start the fire by his belief that others used the parked vehicles for sexual activity. Stephens also allegedly acknowledged that he knew he was being recorded on surveillance cameras and apologized for starting the fire. Evon Stephens, who resides on Farragut Road, has been charged with arson. We are not aware of any reports of sexual activities taking place at the Kings Plaza Parking Garage.